The fast-paced online language competition Nutty Tilez is enough to make many students crack under the pressure but two GSAL students have held their own. Siblings Ilana and Sam Pearce entered the French and Spanish competitions respectively in the fun 56-hour global challenge. In Nutty Tilez students must recall and type words quickly to master each level before they can move onto the next. 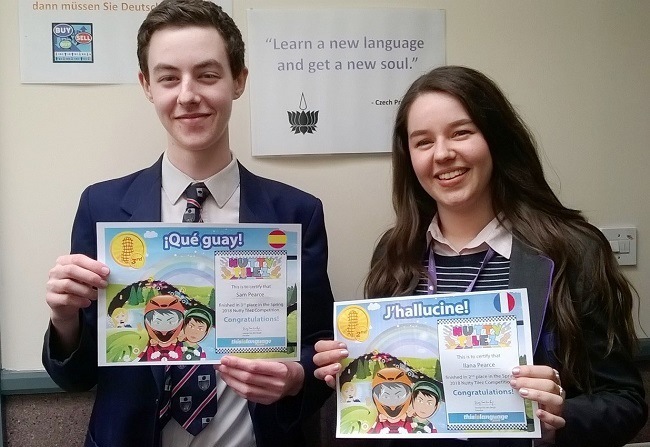 Over 8,500 students worldwide competed, and Ilana Y13 came 2nd in the world in the French competition and her brother Sam Y11 came 3rd in the Spanish competition. Although the pressure is on as participants compete against students around the world, it seems that sibling rivalry really spurred the pair on to succeed. Ilana said: “I was so relieved when I got to the end! My brother was taking part in the Spanish final in the next room and I heard him finish so I just wanted to complete it too. Nutty Tilez is run twice a year by language learning website Thisislanguage.com, for students learning French, Spanish, German, Italian, English and Latin vocabulary. Students play against their own classmates and students around the world, with real time scores on the leaderboard driving the spirit of competition.